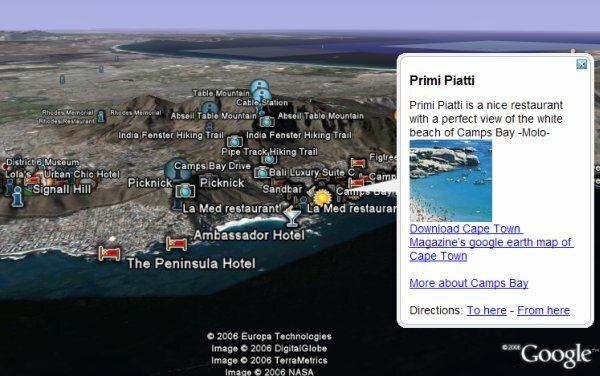 Cape Town Magazine has released a Google Earth map of Cape Town (and surrounding areas). The map is actually a collection of placemarks showing travel related information such as lodging, dining, night-time entertainment, as well as tourist attractions of this South African city and its surroundings. You can view the Cape Town map here , and there are more placemarks for the surrounding area here . Many of the placemarks have pictures, and usually a link at the bottom to more details at the magazine's web site. I imagine we will see more local travel magazines start realizing they can use Google Earth in this way to help people learn more about their area. More importantly, I'm sure the magazines will get new traffic from all over the world who will learn about their publication through the GE placemarks. The more informative and useful the placemark collection, the more likely people will view it in Google Earth. Some more examples of using the new GE 4 time feature with 3D models were posted a week ago at the Google Earth Community. The time animation feature is used to create 3D animations in this case. The first one shows how a Russian Soyuz rocket is set up on its launch pad and launches - read instructions here. The second one shows the Rocket Racing League planes flying by an airport - again, read instructions here. Both models were by JP Wade. In another sign of the increasing use of Google Earth by emergency workers, a software application called Emergeo Mapping v2.2 is now supporting GE. Their software is an OpenGIS-based system designed to streamline information flows between first responders in the field and decision-makers in emergency operation centres (EOCs). I think the significance here is the GE is probably an easier to use interface for viewing GIS data, aerial photos, etc. and quickly share them to a wide range of skillsets (instead of requiring everyone to be trained with GIS software). As a sailor, and a citizen of the Earth, I'm very concerned about the changing state of our oceans. The LA Times has published some excellent, and disturbing, series of articles available online here. 'Hill' at the GEC posted some placemarks to accompany the articles which you can read in this thread. In the past I've written about people using Google Earth in combination with flight simulators. Recently, a flight simulator group that runs a virtual airline (they actually fly the same routes as the real airlines in the flight simulator) modeled after Delta Airlines shared some stuff they are doing. First, they've created a Google Maps interface allowing you to see the current position of pilots flying in their virtual airline. 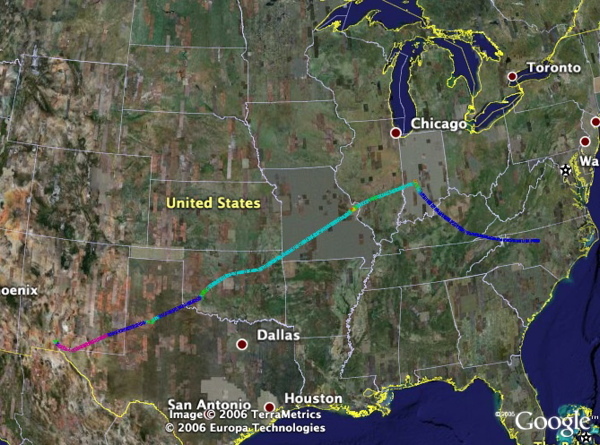 They also have a way to show the routes in Google Earth (which includes clouds, day/night view, and other information). If you're into flying, I suggest checking it out. This weekend will see a lot of halloween parties, and I was thinking yesterday at lunch about what kind of Google Earth fun I could make of it. Suddenly I had it...maybe I could find some halloween decoration for Google Earth. A couple hours later, here is the result . This is the largest halloween decoration on Earth! Enjoy the treat...or is it a trick? Mis amigos de Tagzania me escribieron la semana pasada para compartir un proyecto que hicieron el verano pasado para la Bienal de Arquitectura de Venecia. "La instalación consiste en 16 pantallas geográficamente organizadas: 16 videos de 3 minutos son vistos simultáneamente en esas pantallas. 13 de las pantallas tiene un modelo 3D arquitectónico en ella, desarrollado con SketchUp y llevado a Google Earth." Los edificios están ubicados cuidadosamente en el mismo lugar que se vé en las imágenes satelitales. Pueden leer más sobre esto en Tagzania. Aquí hay un ejemplo de los edificios - el Palau de las Arts (como se vé en la captura de pantalla). Pueden ver las etiquetas de Tagzania para los edificios con vínculos a los archivos GE. ¡Gran trabajo muchachos! Google just pushed out an update to their terrain data which fixes some anomalies like the one highlighted in the story just two days ago called "Cruise Ship Goes Off the Edge of the Earth". There were a number of anomalies like this, and I guess they just decided to go ahead and push out the fixes. I just did a quick perusal and most of the glitches have indeed been fixed up. There are a few elevated beaches on islands with varied terrain, but I didn't see any real anomalies in my checks. Hopefully they will add some higher resolution terrain soon as well. 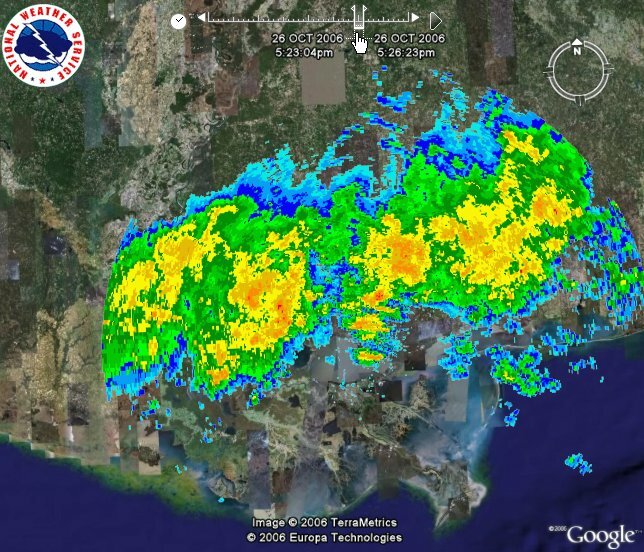 The National Weather Service (NWS) has released experimental radar imagery which takes advantage of Google Earth 4's new time animation feature to show animated data. This means you can see the last hour's worth of radar images animated over Google Earth. Right now, you have to select which city you want to see (hopefully they will add a map interface to make the selection process easier). To use this (you must have the latest Google Earth 4 installed), go to the new experimental NWS RIDGE Loops in KML page, and choose the location in the US you are interested in viewing from the drop down menu. I selected "Louisiana->New Orleans" in the example shown. Then I selected "Composite Reflectivity". Click on "Submit" and you will get a KML file loaded in Google Earth. The time slider gadget should appear in the upper center of GE's main window. Make the slider range real big to load all the images, then make the gadget smaller. Next, select the "Play" button (a little right arrown/triangle on the right edge of the time gadget). This will animate the radar for you. You can also click and drag the middle of the slider back and forth. The NWS released a wider range of KML files for radar and other data (without the animation feature) on this page a few months ago. They also have supported a very nice US-wide radar and warning guide by the Severe Storms Lab. Check it out the US-wide radar example here (be patient, it's a fairly large overlay). Thanks to Tim at the NWS for telling me about the new service. Also mentioned at OgleEarth. Here is an interesting application showing the last 50 flights in Google Earth sold by travel site lastminute.com (updated every minute of course!). Apparently there is a LastMinuteLabs site experimenting with different Google Earth applications. I think this is good marketing, but also fun to watch. The LastMinuteLabs site also led me to a site called HolidayAutos which has put together some Google Earth illustrations of drives between popular destinations with placemarks for good tourist spots to visit. For example, look at the Florida Keys drive , or how about a drive from Italy to Monaco? I really think the travel industry should look more seriously at how Google Earth can be used to help get people excited about travelling. There are so many tools available with GE to help provide useful information, and rich presentations to help people get a feel for what travel to destinations could be like. As promised, I've uploaded a bunch of photos of the events at the Wirefly X PRIZE Cup 2006 which I attended last week. Google was a sponsor and had a booth showing off Google Earth. With some help from Googlers there, I took some aerial photos and we put them up on Google Earth on the same day. This event had rocket launches, jets, telescopes, famous astronauts, Anousheh Ansari (first woman space tourist who just went to the International Space Station), and much more. You have two options for viewing the photos. First, by visiting my Picasa web album here. Or, you can download this KMZ file (725 KBytes) which shows the photos geotagged to their location at the show. I highly recommend you load this aerial photo in Google Earth which was taken on the same day (right after the show ended), to give you some perspective on the exhibits. Note that the aerial photo may take a while to load and you need to zoom in to see all the detail. I geotagged the photos using Picasa 2.5 and Google Earth. After geotagging the photos I chose the "Tools -> Export to Google Earth" option in Picasa to create this file. If you double click on the placemarks for each photo, I've tried to position the view so it is more meaningful (assuming you've loaded the aerial photo above). On the first day of the event, I had my GPS turned on as I walked around the exhibits. You can view the resulting GPS track here . Once again, make sure you have the aerial photo from the link above to get an idea of where I went. You can tell I spent a lot of time visiting the Google booth (in the big tent). This cruise ship ran into a problem while trying to reach a "port" in Kuai, Hawaii. A rather serious disaster in the making - if this was the real Earth. Apparently there are some terrain anomalies in the 3D terrain for Google Earth along this coastline. 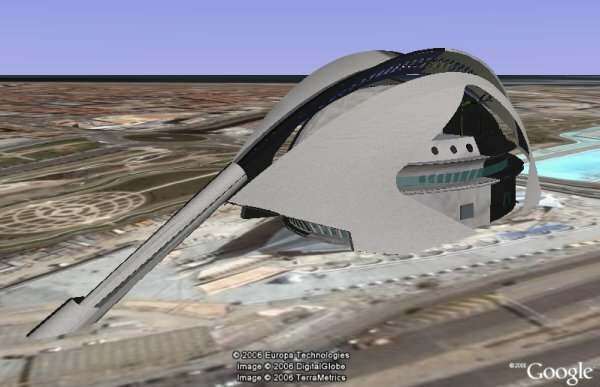 'svens' at the Google Earth Community decided to grab a cruise ship model from the Google 3DWarehouse and have a little fun with illustrating the anomaly. If you open the folder on the left for the "Cruise Ship Crash" you can select the "Tour" folder and choose "Tools -> Play Tour" from the GE menu to get a tour of the site. While you're visiting, check out Kuai - it still looks like paradise in the satellite photos in GE. 'svens' says he also wanted to show how easy it is to grab a 3D model and have fun in Google Earth. All you need is the free Google SketchUp and the 3DWarehouse to make your own. Digg it! AGU - The American Geophysical Union is having a conference on Virtual Globes on December 11-15 in San Francisco. Their schedule of presentations (click on the photos for more details on each one) looks very interesting. I'm going to have to consider going to this. Especially because I see Valery Hronusov from Russia will be presenting - I've been admiring his innovative Google Earth content for a year now and we haven't met yet. Superoverlay tools - Two tools have come out for helping people create large high resolution image overlays for Google Earth using the new GE 4 region features (which breaks the images up into tiles different zoom levels). OgleEarth has a very good review with links to both tools. Marijuana bust - this one has been spread all over the blogosphere already. But, just in case you missed it: A guy was pulled over by a sheriff in Racine, Wisconsin. The sheriff smelled marijuana and discovered two large bags of the stuff. During the arrest, he found a GPS on the driver and later loaded the GPS data into Google Earth. They found several sites where he was growing the stuff. He now faces a lot jail time and fines. Read the story here from the local news web page. Sensor web update - Jeremy Cothran wrote me last week that he had updated his ocean-related real-time sensor data which I wrote about back in April. I was too busy last week to get to write about it, but Stefan at OgleEarth writes a glowing report for why Jeremy's methods serve as a model for any scientific organization to share real-time data through Google Earth. Burning Man - Scott, one of the guys who works on the USGS Google Earth content, wrote me that he has created an image overlay of a kite-based aerial photo he took while at the Burning Man 2006. Google has already inserted a recent aerial photo of the site. Check out Scott's cool gallery of kite photos of the event. Yesterday I flew a Cessna 182 back from Las Cruces, New Mexico to Sanford, NC. Fortunately, there was a 15-35 knot tail wind the whole way - which made it possible to make it back in one day. Normally, this plane cruises at 140 knots. But, I was averaging about 165 knots (190 mph/305 kph) for the trip. You can see my GPS track in Google Earth colorized by altitude. I stayed up at 9,000 feet altitude where the winds are a bit faster. I ended up making two stops - one in Sherman, Texas where I fueled and got some lunch; and another in Winchester, Tennessee for some fuel and a bio-break. This also helped give me a bit of a rest between legs of the trip. I took a few photos along the way which I will georeference and share later in the week. I may even overlay them over Google's aerial photos just so you can compare. Oh, and I forgot to turn on the handheld GPS (just used to record the track) until shortly after takeoff from Las Cruces, New Mexico. I need to add that to my checklist. For you pilots reading this: I used a useful planning tool at AirNav.com which lets you plan a trip (link seems broken at the moment) by finding the cheapest reported fuel at airports between two points. Both of the airports I picked had fuel as much as $1/gallon less expensive as other area airports. Sherman Municipal was only $2.75/gallon (self-serve). You will also note I got diverted around the Charlotte airspace - they rarely let general aviation planes through - even when the flight density is low. Flight out to Las Cruces - make sure you read the bottom of the blog entry for more details on the flight conditions. Since I was traveling last week, I'm a little late putting this up. Adam at GPSVisualizer.com put together a time animation of the seismic readings of the Earthquake in Hawaii plus the aftershocks. The circles are colorized by depth and sized by magnitude. The largest being the 6.6 magnitude earthquake which made the news. Once you've loaded this Hawaii Earthquake file with Google Earth 4 (so you can see the time animation - download here if you don't have 4.0.2091 or greater), you can use the time slider gadget in the top of the screen to see the earthquake and aftershocks unfold. Last night, Google released some new layer changes for Google Earth. The "Register to Vote" layer added a short while ago has been changed to the "2006 US Election Guide" and includes two sub-layers: "US Election Guide" (click on the placemarks for useful voting information), and "US Congressional Districts" (which shows the borders of those districts). These layers are NOT turned on by default, but the information is more useful. It appears there have been some improvements to reduce the amount of clutter when viewing the large number of placemarks if you turn on the Google Earth Community layers. [EDIT 30-Oct: Apparently some of the changes to the layer won't be visible until the next release of GE 4]. Google let me know these changes went live last night while I was visiting their booth today at the X PRIZE Cup. By the way, Larry Page - one of the co-founders of Google - dropped by to visit the booth (and his employees). Larry was here to attend the X PRIZE Cup and attend a board meeting of the X PRIZE Foundation. I was fortunate enough to be invited to have dinner with Larry and some of the Google Earth team this evening. There was a silly rumor in the blogosphere last night, but (as TechCrunch has already established) Google did not buy the original Space Ship One. Google has acquired a replica of the space ship for display at the GooglePlex. I plan to summarize a few other highlights about my trip next week in a trip report, and I plan to share some of the photos I took. Sunday I will be spending all day trying to make it back to North Carolina from New Mexico in a small plane. Wish me luck for a strong tailwind! With some help from Google, we have created the first example (that I'm aware of) of a fully rectified (aligned) aerial photograph taken and put into Google Earth on the same day. The photo was taken by myself in a Cessna 182 from the side window (yes, we had to make a very steep turn to get this straight-down view). Check it out for yourself by downloading this and zoom in on the Las Cruces airport. The entire image may take a while to load since it is about 30 MBytes, but it loads like a normal Google Earth image (with tiles thanks to the Regionator). The photo is of the Las Cruces Airport just after the end of the first day, October 20, of the Wirefly X PRIZE Cup. You can see the planes, rockets, and exhibitor tents. 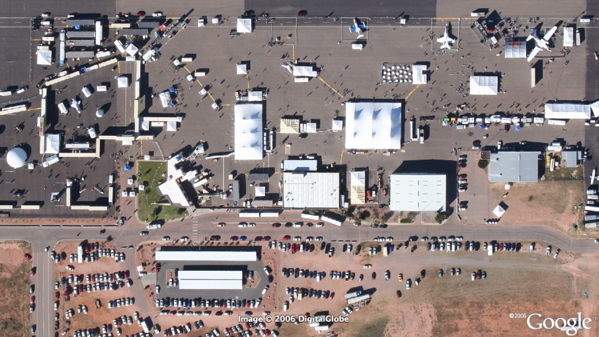 Google showed an earlier aerial photo we took in the morning during the day in their booth. People were amazed, and some even tried to find themselves in the photo. Thanks to Robin - who helped fly the plane while I stuck my head out the window to photograph. And, thanks to one of the Google folks - Roger - who processed the photos and orthorectified them for Google Earth. Let us know what you think! By the way, take a look at the 3D models we created of the same show in Google Earth. In response to a wish from Stefan Geens at OgleEarth, Chris Hanson at 3DNature.com has created an enhanced terrain and texture for the Matterhorn. The built-in terrain data for Google Earth is too low of resolution to cature this sharp and refined mountain peak. So, Chris gathered together some 30 meter resolution digital elevation model data for the peak and draped the data with a Landsat photo processed by AlaphaPixel's Pixelsense. You can see the results of a new Matterhorn in Google Earth here (assuming you are using Google Earth 4). I'm sure Stefan will be pleased he got his wish... And nice work Chris! Trip Report: My blog entries may be a bit lighter this week. 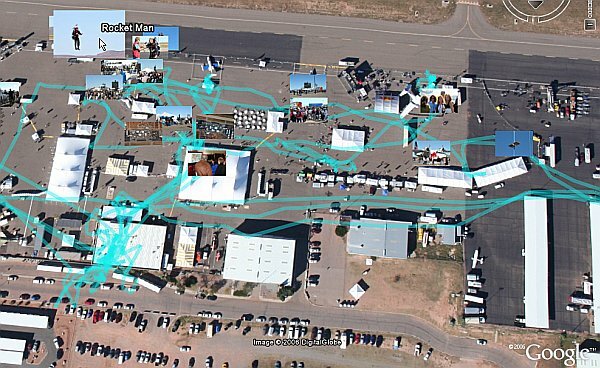 I left on Sunday to fly my Cessna 182 out to Las Cruces, New Mexico from North Carolina (where I live) for the X PRIZE Cup. 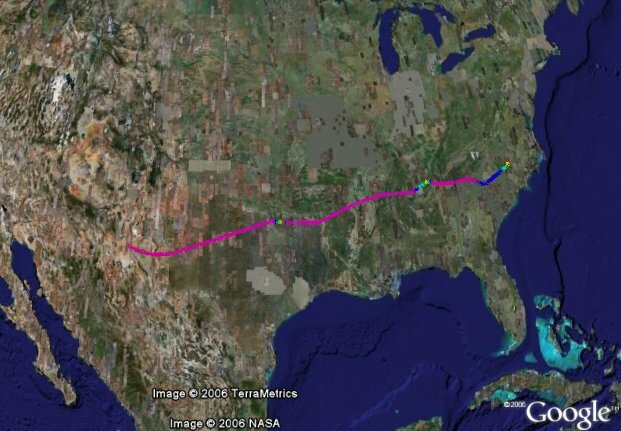 It's a long trip for a plane with a cruising speed of 140 knots (165 mph). You can see my flight in 3D in Google Earth (altitudes are colorized) by looking in Google Earth with this file . Trip report continues below. In April, I wrote about an ocean sensor web developed by Jeremy Cochran of the University of South Carolina. He sent me an E-mail to let me know he has published a new release with more capabilities. You can read a good summary of what's new, with links, at OgleEarth. 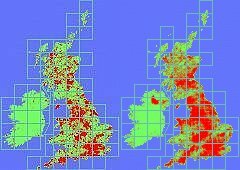 The BBC News has published an article called "The Map Gap". The article makes comparisons between hundreds of years of paper-based 2D maps compared to new virtual globe 3D maps like Google Earth. The reporter interviewed Steve Chilton, chair of the Society of Cartographers. Mr. Chilton makes some positive observations about the advantages of the 3D perspective and dynamic data, but fails to recognize the significance of the vast amount of data available at your fingertips in the form of the layers in Google Earth. Read Stefan's observations at OgleEarth. New Google Earth Blog - one of the writers for the Google Earth User Guide, John Gardiner who works at Google, has begun publishing a blog called Using Google Earth. He intends to start with some basics, and then write some entries covering advanced features of GE. Trip report continued: There was a weather system moving across the continental US, and I needed to head north quite a bit to reduce the chance of thunderstorms. (By the way, I forgot to turn on my handheld GPS for the first 15 minutes when I left Sanford, NC). First stop was in Indiana for some fuel and a much needed break (after 4.5 hours of flying). I stopped for the night, to get some rest and wait for the weather to start moving over, in Saint Louis, Missouri. On Monday morning, I flew out in light rain intending to stop in Clinton, OK for inexpensive fuel. But, low clouds at that location caused me to divert to Hobart, OK. After a brief lunch and refueling, and continued my flight to Las Cruces. I made another stop in Lubbock, TX for a brief rest stop. Mountains and restricted airspaces required me to fly almost to El Paso before turning towards Las Cruces. The reason I flew my plane is so I could take some aerial photography of the X PRIZE Cup. I did a practice run yesterday and the photos turned out pretty well. I'll be making some of them available in Google Earth soon. You will also be seeing some web cam shots of the event in Google Earth on Friday and Saturday (the two big days of the event). Watch the X PRIZE Cup site on those two days for web casts which will let you watch the events all day. More work is being done with Google Earth to make archeological discoveries. About a year ago an Italian systems analyst used aerial photography from Google Earth to make a discovery of the remains of a Roman villa. Now, it turns out a friend of mine by the name of Scott Madry has made the news with some archeological discoveries in France. He appears in the Raleigh News & Observer. For many years, Scott has analyzed aerial and satellite photos for his work. One area of his research has been how a Celtic people called the Aedui lived in France for about three centuries starting about 300 B.C. 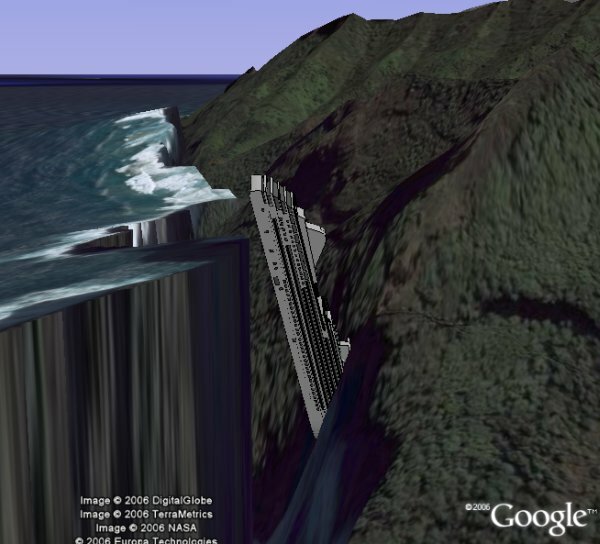 Scott had read about the Italian's discovery and decided to see what Google Earth could do for him. He was amazed by the quality of the data available for free in GE, and he was quick to find new sites. Scott says: "I found more in the first five, six, seven hours than I've found in years of traditional field surveys and aerial archaeology." He ended up discovering over 100 candidate locations before presenting his findings at the international Computer Applications and Quantitative Methods in Archaeology conference this spring. Other researchers were fascinated enough that Scott wil be offering a course on using the technology for archeologic discovery at next year's event. Yet another amazing application of Google Earth's wealth of information! 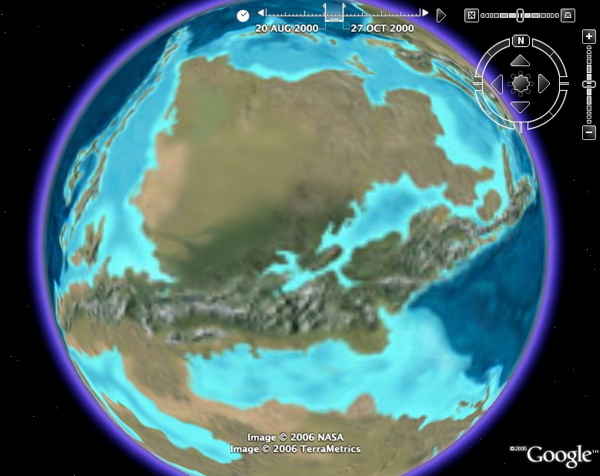 An excellent example of the new time animation feature in Google Earth 4 has been created which illustrates the history of Earth's continents from the pre-Cambrian period to the present (the last 600 million years). The animation was created by Google Earth Community member Valery Hronusov who is a GIS scientist living in Perm, Russia. Load the global palegeographic animation , and turn on the network link which will appear in your Temporary Places. Double click on the folder to get a global view (or just zoom out to space). The time slider gadget will appear (you must be using Google Earth 4 version 4.0.2080 or greater) in the upper portion of your screen. Slide the gadget back and forth (the first time you do this it may pause to load the different versions of the earth's continents). You can select the "play" button (a triangular button like the one on a TV remote) to the right of the time gadget to play a loop of the animation. Great work Valery! See other things Valery has developed which have been written about at GEB. 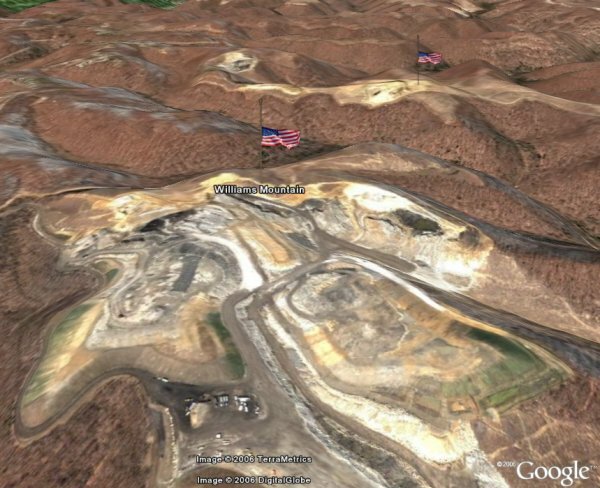 In an attempt to help spread the word about a travesty of environmental damage being caused by the coal mining industry in the US, an organization has turned to Google Earth to provide undeniable evidence of the damage. The coal industry has been using a new technique for getting to coal that is much more damaging to the environment (although less expensive for them to conduct). They basically blast the tops off mountains to get to the coal, and move the tops of the mountains into the valley's (covering the streams and wildlife in the process). A web site has been created called "ILoveMountains.org" which has a link to the Google Earth content , or you can watch videos documenting the process (and damage). Looking at the areas in Google Earth, flags mark the "memorial" to destroyed mountains. The devastation is easily visible even in the low-res areas. How the coal industry could do this much damage without a greater outcry is a wonder of political clout. Of course, hiding the evidence in remote mountainous areas of West Virginia and Kentucky helped. At least until Google Earth arrived. The web site provides steps on what you can do (if you are a US citizen) to help. 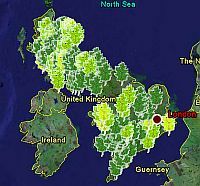 Last year, this cool application was posted at the Google Earth Community which lets you view the current autumn tree leaf colour in the UK . 'RobRoy' wrote an application which grabs the current leaf colour for different regions in the UK from a Forrestry web site and shows the leaf colour changes in Google Earth. Since it is a network link, all you have to do is save it in your "My Places" and turn it on and it will automatically check for changes and show you the current leaf colours. I check on it every couple of days just for fun (even though I don't live in the UK). You can view RoyRoy's post where he announced his network link at the Google Earth Community. Now, if only some people would write Autumn Color programs for the rest of the world. I'm surprised after seeing this last year someone didn't think of doing it for other countries by now. Movie Maker Module - Record 3D viewer imagery and export movies of tours for websites or presentations. Premium Printing Module - Save and print at 4800 pixels per inch and print high-resolution images up to 11" x 17". GIS Data Importer - Incorporate GIS data in .shp or .tab file formats. Examples of data include parcel data, demographics data and 3D building data. You can use these new features the next time you open Google Earth Pro. Also, our Technical Support options have changed. We've added live chat & email support to replace telephone support. You can see all the features at the Google Earth Pro features page. via OgleEarth. NOTE: the models in this story require Google Earth 4, so make sure you have it installed. You may remember Space Ship One - the strange-looking space craft launched out of the Mojave desert twice in two weeks to win the 10 million dollar Ansari X PRIZE in 2004. The spacecraft was designed by Burt Rutan (designer of many unique aircraft) and funded by Microsoft co-founder Paul Allen. 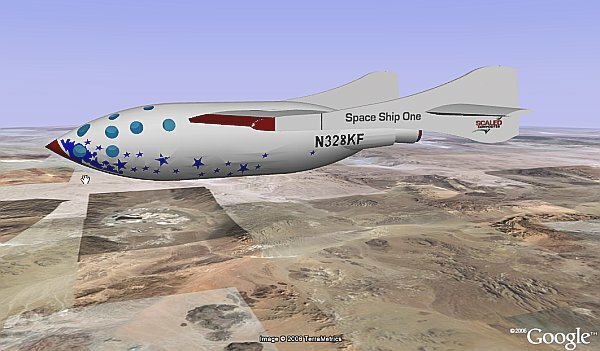 You can now view a complete overview of the flight of Space Ship One in Google Earth (large file: 3.5 Mbytes - you may not want to try this unless you have a good graphics card with lots of memory) thanks to the efforts of someone from the Google Earth Community called 'jpwade' who used SketchUp to create the 3D models. Once you open the file, you can click on the "Tour" folder and choose "Tools -> Play Tour" to get a flying tour of how Space Ship One flew to space and back. This GE file has some excellent 3D models of Space Ship One and its sister plane the White Knight One. It's good to see Google is starting to promote some of their better applications to educators who can really use some of the free applications to enhance knowledge learning. As part of their new push to educators, Google has a page about Google Earth located here. The page includes links to useful materials and even stories from teachers who are using the tool in their classrooms. For quite some time I have been advocating Google Earth as a great tool for many areas of education. I think educators should also review this useful list of Google Earth resources and possible subjects which can use Google Earth. The list also includes references to web sites by educators who are using Google Earth and lesson plans. Also, see an example of some students who recently used Google Earth and made the local (and international - courtesy of GEB) news. So, it goes way beyond just the aerial and satellite photos of Google Earth when it comes to helping students learn about our world. GE does so much more. Linda Naill, an aircraft dispatcher at the Sierra Front Interagency Dispatch Center in Minden, Nev., said she mostly uses the Google version in her job managing up to 20 aircraft at a time from the facility, which oversees 11.5 million acres. "The neat thing about Google Earth is they're three-dimensional," Naill said. "When I put a [temporary flight restriction] in place, I can really see if I'm impacting someone, and if someone violates it, we can easily figure that out." Here is the location of the building which was hit by a small airplane this afternoon. 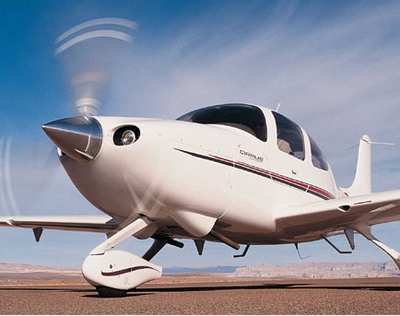 Reports are that the plane was owned, and was flown, by New York Yankees pitcher Cory Lidle and that it was a Cirrus SR20 aircraft. You can read the story at CBS News here. In Google Earth, there are no 3D building models in the "3D Buildings" layer for this part of Manhatten. So, you can't see how the area would look from the air. The Wirefly X Prize Cup is an outdoor space exposition hosting several competitions for some major prizes (including over $2.5 Million from NASA) for space related technology. The event is being held on October 20-21, 2006 (see here for details) at the Las Cruces Airport in New Mexico. It will be a great educational event with rocket launches, NASA exhibits, jets, and more. With some help from Google - a sponsor of the event - we have put together a 3D model of the airport and the X Prize Cup event including examples of exhibits, stage, and even the large TV projection screen. This 3D collection uses photo textures for realism which requires Google Earth Version 4 (beta). Download the new version here if you don't already have it. Open the X PRIZE Cup in 3D file and then select the "Tour" folder on the left. Choose "Tools -> Play Tour" from the menu (or select the tv-remote-like triangular play button below the Places pane) to start a flying tour of the exposition. If you open the models folder you can turn on a X Racer rocket plane sitting next to the stage. 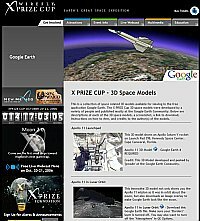 Here is the X PRIZE Cup page for the 3D model. Alternatively, you can watch a Google video showing the X PRIZE Cup in 3D content. You can imagine what this event will be like with 20,000 or so people, NASA exhibits, rockets being launched, jets flown by astronauts going by, model rockets launched by school kids, and much more. If you can get to Las Cruces by October 20 or 21, I highly recommend it. By the way, I have another interesting 3D space model for GE coming tomorrow, and there will be more content for the XPC event being shown in Google Earth during the event itself. So, watch this blog or the X PRIZE Cup web site for more information. Aerial Photo - Taken at 3:15 PM - October 20, 2006 of the Wirefly X PRIZE Cup from an airplane flying overhead. This is the first time an aerial photo was taken, processed, and published on Google Earth on the same day. NOTE: Make sure you are using Google Earth 4. The test of what may have been a nuclear bomb in North Korea has stirred up a political storm around the world. 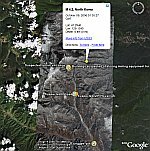 You can check out in Google Earth some of the locations in North Korea where they have been working on the technology by viewing this Google Earth file from jeffrey at Armscontrolwonk.com. Also, if you load up the USGS Seismic Real-time Monitoring tool for Google Earth you can see where the seismic activity was detected (a 4.2 Magnitude disturbance) yesterday. Here is a slideshow of screenshots of satellite photos from Eweek. Here is some analysis of the nuclear infrastructure in North Korea from GlobalSecurity. And here is a New York Times article which shows a screenshot from Google Earth of the test area. 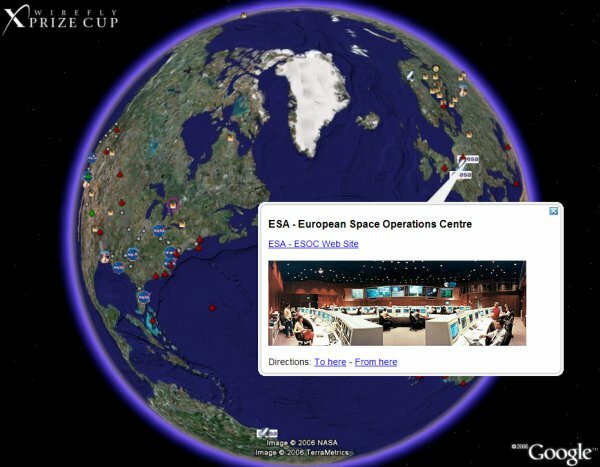 The Google Earth Space Atlas was put together in honor of the Wirefly X PRIZE Cup. 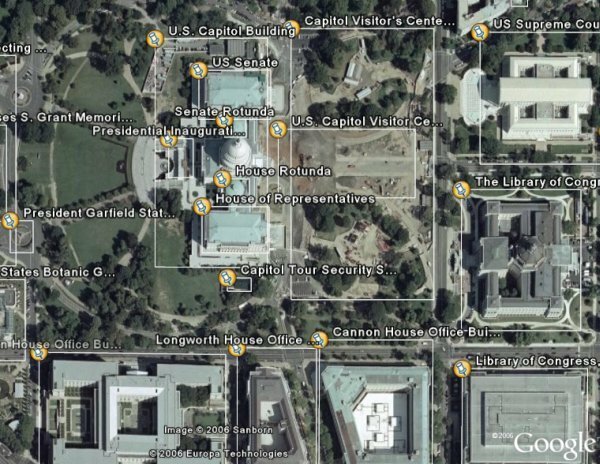 The concept is to have to have one location for a map of Google Earth placemarks for anything space-related on the Earth. 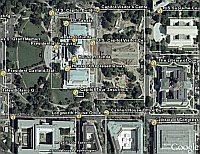 We have pulled together collections from the Google Earth Community, asked for help from Space.com, and created a wealth of new material. Included are placemarks to space centers of many countries, launch sites, space museums, planetariums, moon trees, meteor impact craters, space shuttle landing sites, and more (See below for a list). Check out the Space Atlas now . Click on the placemarks for more information, and look at the Space Atlas folder in your Places pane to turn on the many other collections available. Space.com's collections of launch sites, observatories, space museums, astronomy clubs, planetariums, and more. This continues a series of stories about a wealth of new space-related content for Google Earth from the Wirefly X PRIZE Cup which is an outdoor space exposition hosting several competitions for some major prizes (including over $2.5 Million from NASA) for space related technology. The event is being held on October 20-21, 2006 (see here for details) at the Las Cruces Airport in New Mexico. It will be a great educational event with rocket launches, NASA exhibits, jets, and more. To help promote the event I have been helping put together some space-related Google Earth content. 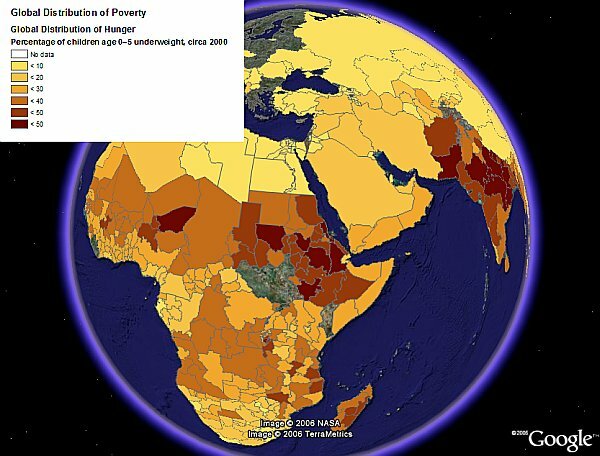 Declan Butler of Nature Magazine last week reported on the release of some important GIS data from Columbia University regarding world-wide poverty. He created some Google Earth files showing the data, but the files were kind of large. He now reports he has created a network link which brings in the data much more elegantly as you zoom in to look at each country. Open the network link to try different sets of data. Newsweek has written a story on Why Aerial Mapping is Taking Off which does a good job of describing how Google Earth's population has expanded the world's view of the importance of aerial photography. Some people look at all this free aerial photography and assume it is killing the business of selling aerial photography. But, these aerial photographers are saying it is raising awareness of the need for even more current and better photography and provided new big customers (Google, Microsoft, Yahoo and other mapping providers). Digital Geography reports on some new classroom projects done with Google Earth. If you are a teacher who has been thinking of using Google Earth in the class room, check out "Educational Uses for Google Earth". 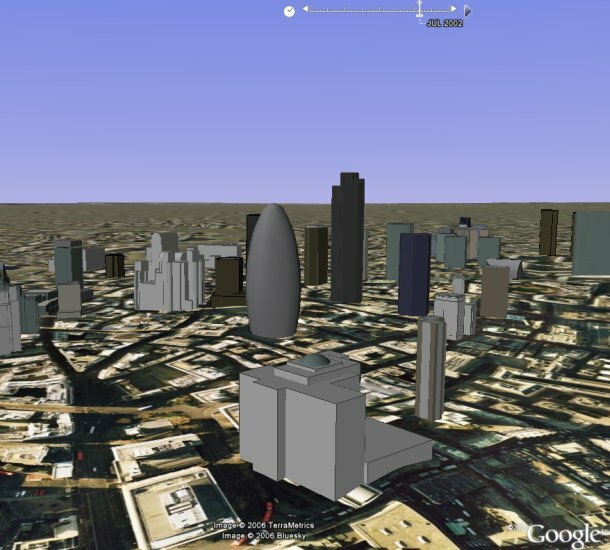 Animation of London Building Growth in Google Earth - Cool! One of the Google Earth Community members, 'barnabu', has created an amazing animation using the new time feature in the latest Google Earth 4 Beta. He took a set of 3D models showing a timeline of the 60 tallest structures built (and demolished) in the City from the 1950s onwards (on top of the aerial photos of London). After loading the London buildings file you will be able to see an animation which simulates the buildings being constructed over time. You MUST have the latest Google Earth 4 beta (version 4.0.209x or greater). barnabu has written some illustrated instructions in his post. Or you can try following my briefer instructions: First, set the time slider range to as small as possible, then select the "Animation" folder under the "City of London" folder in the Places. Finally select the "Play" button (little right arrow / triangle button) on the right hand side of the time gadget in the upper part of the screen (this starts a loop of the animation). This is one of the slickest time animation implementations I've seen yet! By the way, barnabu also did these interesting 3D models: Global Clouds in 3D, Google Saturn, King's College Chapel, and MI-6 Headqaurters. Since the event is being held in New Mexico, the Department of Tourism for the state is releasing a collection of placemarks which show the locations of interesting places which have some tie to space. Contained are placemarks showing the location of ancient indian petroglyphs recording a supernova, remote areas where Apollo astronauts trained for moon missions, locations of secret labs such as Sandia Labs and Lawrence Livermore Laboratories, the famous Roswell UFO site, and more. 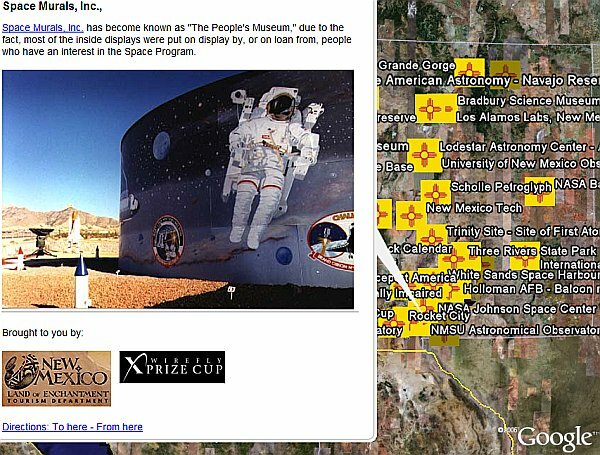 See the X PRIZE Cup web page on the New Mexico Space Trails. Well, it's not often that the area I live near makes the national headline news. Apex, North Carolina had a dangerous chemical fire last night at a plant which handles hazardous materials. The fire raged uncontrolled because firefighters could not get close due to the hazardous fumes. There were apparently barrels of chemicals which exploded in a series of noxious gas spewing bursts. It spread to other nearby industrial buildings which had some fuel tanks which exploded as well. You can see the small street of industrial buildings is right next to a residential community. About 15,000 residents were evacuated from Apex because of the fire. I was up late watching the news which is why I was a couple of hours late writing in the blog today. I was pleased to see our local news WRAL-TV used Google Earth to show the location of the fire, and they have a link to it in Google Maps on their site as well. 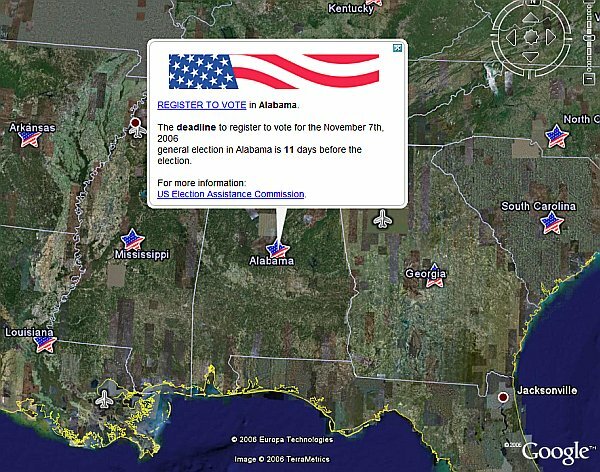 Well, I opened up Google Earth this morning and there was a new layer turned on: "Register to Vote". Placemarks for each state in the US have a link to registering to vote for that state and a reminder of the deadline for the November 7th elections. Now Google is helping out the political system out. If you've already registered, or are not interested in voting, then you simply turn off the "Register to Vote" layer in the Layers pane on the lower left. I'm curious whether only people with IP addresses in the US see this layer, or if everyone in the world sees it? According to non-US GEB commenters below, it does appear in other countries. I think Google should not do this as a layer unless they can constrain it to those people who it matters to. For now, they should default it to turned off. Got a tip on some more updates: The Google Earth Community Layer updated to October 1st. This means all placemarks posted to the correct forums now appear in the layers. It appears Google is getting better about doing this more regularly. The featured content layer was updated for corrections. Also, the Digital Globe layers, which shows you the available images and dates from DG's library, has been updated through September. The Wirefly X PRIZE Cup is an outdoor space exposition hosting several competitions for some major prizes (including over $2.5 Million from NASA) for space related technology. The event is being held on October 20-21, 2006 (see here for details) at the Las Cruces Airport in New Mexico. It will be a great educational event with rocket launches, NASA exhibits, jets, and more. To help promote the event I have been helping put together some space-related Google Earth content. The first part of the content (more will be released over the next few days) is a showcase of 3D Space Models for Google Earth. If you follow the link you will see over a dozen different rokets, space stations, satellites and more in 3D. The models were mostly developed by many people in the Google Earth Community forum for 3D Models. The X PRIZE Cup is the continuation of what was started by the Ansari X PRIZE - a $10 Million prize won by Burt Rutan with Space Ship One. The whole idea behind the X PRIZE, which was conceived by my friend Peter Diamandis, is to help encourage further development of space travel - and its working! 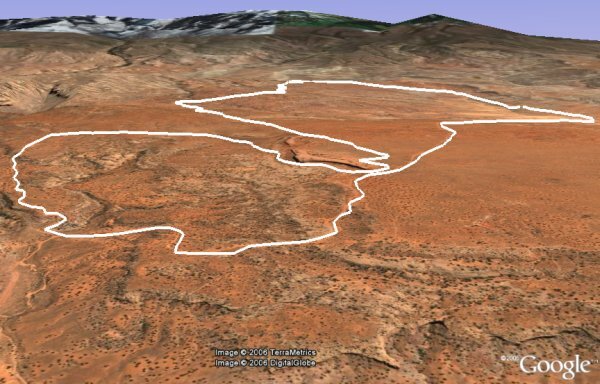 Google Earth is sponsoring a team of five Googlers (employees of Google) at the 24 Hours of Moab mountain bike race. You can read the team's blog (The Google Earthlings) about the event. The most recent entry is by one of the writers of the GE user documentation who talks about uploading GPS tracks (which they plan to do after the race) and shares a file showing the race course in GE of course. Read other blog entries for other GE content like this one by Tasha (who is responsible for the Sightseer newsletter and works on marketing for SketchUp as well). Declan Butler, a senior editor for Nature Magazine, has discovered that Columbia University has published important GIS data related to poverty. Declan took some of the data and has quickly created some maps for Google Earth. Here is a global hunger map (large file - 4.6 MBytes) and a global infant mortality rate map (large file - 5.4 Mbytes). Declan says more can be done to improve (and reduce the size of) the maps for Google Earth, but this was a quick illustration of the power of the data. Declan also hosts visualizations for showing the spread of avian flu. See stories here and here. 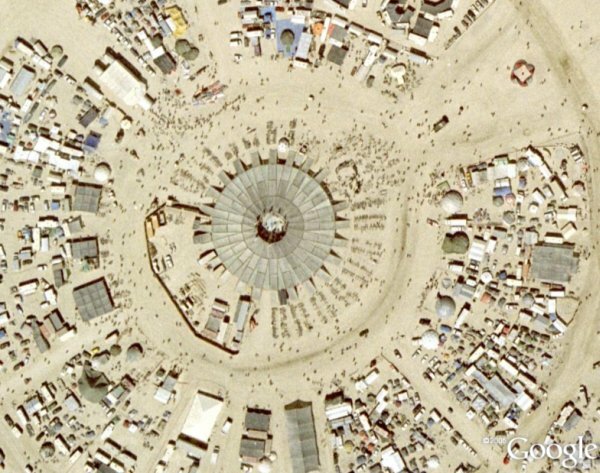 Looks like Google acquired an aerial photo of the Burning Man 2006 event and has incorporated it as part of the big update pushed out today. Check it out here. Also, you can view it in Google Maps. It looks like an aerial photo showing the event during its busiest time. The event was held on August 28 through September 4th, so this data is only a month old! How's that for current data? The resolution of this image looks to be a little less than 1 foot per pixel. You can see people moving around as little blobs, although you can't make out any real details. The digital globe data has been updated as well. This means there are new strips of satellite photos all over the planet. I'm sure reports will begin flooding in about new places covered. I noticed a lot of new strips in Africa for example. I had a report from GEB reader Geoffrey that Ann Arbor, Michigan had some new aerial or satellite photos in Google Maps. I confirmed there was new imagery on the west side in Google Maps, but not Google Earth. Just now, I discovered Google Earth got the update as well. I also just received word that London has new photos, and have confirmed that the London photos have much better quality photos (at least in the area of the London Eye). An entry in Google's Enterprise Blog announces that Google Earth Enterprise is increasingly being used by those in the Energy Industry. The entry says: "With huge amounts of exploration imagery and the need to manage oil rigs, pipelines, equipment etc. 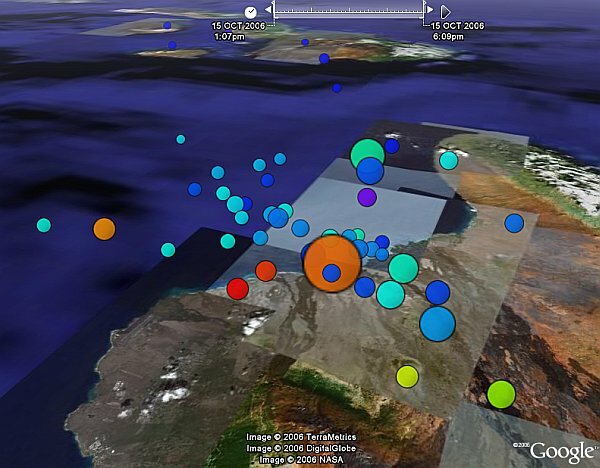 all over the world, the energy industry is a natural fit for Google Earth Enterprise." The entry also says that Spatial Energy has joined the Google Enterprise Professional program as a Google Earth Specialist. Spatial Energy's home page now prominently displays a Google Earth animation and promotes their ability to offer products and services helping companies with Google Earth Enterprise. The top-end product Google Earth Enterprise (GEE) is actually a powerful tool. GEE enables you to build your own aerial imagery and layers. Check out this Google Earth Enterprise blog which shares some experiences with the product. Exciting news! A few months ago one of the most talked about (and most used) Google mapping applications was released under the name Wikimapia. Wikimapia is a tool which lets anyone mark something in the Google Maps satellite/aerial photos with a rectangle and then write about it and/or provide links to Wikipedia. Just like Wikipedia, it lets anyone edit the commentaries / descriptions. The interface is intuitive and clean. As soon as I first saw it, I sent an E-mail suggesting they create a Google Earth network link to show the same information. Well, Matt Jones just wrote to tell me they now have Wikimapia for Google Earth (see his blog entry). Try out the Wikimapia KML network link and you will be able to zoom in and see Wikimapia areas in Google Earth for your current view. The more you zoom in, the more you see. You can click on the placemarks to get a link to the Wikimapia descriptions. I'm so glad they finally decided to support GE as well! This is just the beginning of the possibilities. I've been thinking about new ways Wikimapia could be extended with Google Earth. For example, creating polygons with the rectangles and filling it with varying colors at a low transparency would make it look even better. There's also some possibilities created with the new GE API (just announced recently by Google) which would allow more interesting integration between Wikimapia and GE. Thanks to Matt for letting me know about it, and the Wikimapia people for implementing GE support! By the way, for the Mac OS X there is also an undocumented API for Applescript. Read about it here. My hope is that we will soon start seeing a collection of interesting add-ons to Google Earth which enable a wealth of valuable capabilities, tools, visualizations and even games. So, applications developers start your engines - its time to get innovative!